Birds of paradise that blossom! Those of you who journeyed with us on Nature Trail two weeks ago would remember the magnificent feathered friend called the bird of paradise we featured in this newspaper. You may also recall we mentioned the fact that this beautiful bird’s name has been given to some plant species which bear spectacular flowers that closely resemble this bird. The pictures depicted here would have already impressed upon you of this fact and their beauty. The popular bird of paradise plant which is aptly named for the unique shape of flower that resembles the beak and head plumage of the bird, and has bright colours, is a member of the Strelitziaceae family. 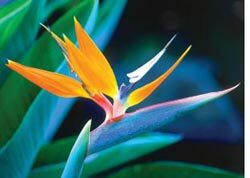 There are five species of the genus Strelitzia and they are all native to South Africa. It is also known as the crane flower in its native land and is considered to be one of the most colourful flowers in the world! 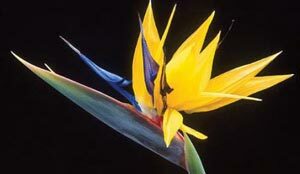 The five species of this plant which is closely related to the banana are, white bird of paradise (Strelitzia alba), Mountain Strelitzia (Strelitzia caudata), white or giant bird of paradise, wild banana (Strelitzia nicoloai) bird of paradise or crane lilly (Strelitzia reginae) and African desert banana (Strelitzia juncea). There are also many hybrids of this plant, which are pollinated by sunbirds. 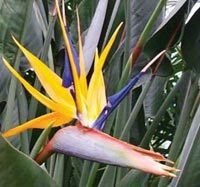 Today these exotic birds of paradise plants are found in many warm-weather areas around the world such as Hawaii and southern California. 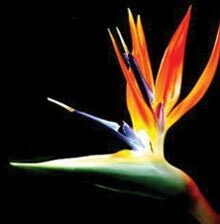 There are jungle-type bird of paradise flowers such as the Strelitzia regime and Strelitzia nicolai, and also desert-type birds of paradise plants which are unrelated to the jungle type plants. (see box). The jungle type birds of paradise plants which are perennials (lasting through the year), are tropical plants that grow in warm, humid climates. White/giant bird of paradise or wild banana (S. nicolai) which is the largest in the genus, grows to a height of 10 metres while the others typically reach 2 to 3.5 metre heights. The plants which grow from rhizomes (underground stems) have stiff, erect, leathery concave and oblong leaves. They are generally bluish-green in colour and are 30-200 cm long and 10-80 cm broad. Even though the leaves are similar to banana leaves in appearance, they have a longer petiole and are arranged strictly in two ranks to form a fan-like crown of evergreen foliage. The leathery leaves are held upright on stiff, leafstalks which are about six inches wide and eighteen inches long. The evergreen leaves do not drop from the plant. The exotic flower which is responsible for the popularity of this otherwise simple, bannana-like plant, is actually a combination of blue petals and orange sepals that emerge from a beak-like bract (modified leaf). 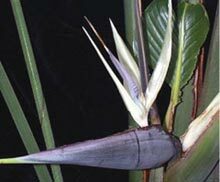 This hard beak-like bract or sheath from which the flower comes out, is termed the ‘spathe’. This spathe which is placed perpendicular to the stem only gives it the appearance of a bird’s head and beak. The showy blossoms which consists of three brilliant orange sepals and three purplish-blue petals, emerge one at a time. Two of the blue petals are joined together to form an arrow-like nectary from which the sunbirds drink the nectar. And when the sunbirds sit on it, the petals open for the weight, covering the bird’s feet in pollen which it then carries to the next plant it visits, pollinating the plants. The desert-type variety which is totally unrelated to the jungle-type variety comprises shrubs and small trees. They are native to tropical or sub tropical regions of the Western Hemisphere and belong to the Caesalphina genus in the legume family. They include the red bird of paradise (Caesalphina pulcherrima), Mexican bird of paradise (Caesalphina mexicana) and yellow bird of paradise (Caesalphina gilliesii).Even though the plants and the flowers of these three varieties are not as large as the Strelitzia genus, the flowers are colourful and spectacular. The flowers which come out in clusters and are different in shape to the flowers in the jungle variety, resemble azalea flowers when fully open. The Mexican bird of paradise and yellow bird of paradise both have yellow coloured blossoms while the red bird of paradise has red blossoms as the name suggests. However, some people mix up red bird of paradise plants with the Mexican variety. There are different shades of these flowers such as the pink due to hybrids. All three types of this group of plants thrive in dry conditions and are known to be drought tolerant plants. The seeds of all these plants are said to be toxic. Some of the other common names by which these flowers are known include Peacock flowers, Pride of Barbados and Poinciana (not to be mistaken with poinsettias which are popular during the Christmas season). * Birds of paradise flowers bloom from September through May. * The herbaceous plant makes an attractive landscape plant in Florida, but it needs protection from the cold in the southern part of the state. Freezing temperatures damage the developing flower buds and flowers. It can however tolerate temperatures as low as 24 degrees Farenheit, for a short period of time. * Healthy, mature plants can produce as many as three dozen flower spikes a year. These would last up to two weeks even after its cut. * The genus name (the scientific name Strelitzia) is given after the Dutchess of Mecklenburgh - Strelitz, birthplace of Queen Charlotte of UK. 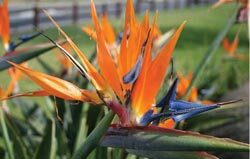 * Bird of paradise plants especially Strelitzia reginae are cultivated on a commercial scale as ornamental flowers in warmer regions of California and Hawaii and as a greenhouse plant in other regions. * When growing this plant, dead plant material has to be removed promptly as a precaution against fungal attacks. Proper watering and fertilizing is also very important. * Blooms appear intermittently most of the year.